A mobile version of Shoot Many Robots has released today through Google Play. Developed by Demiurge (creators of the first Shoot Many Robots) and Owlchemy Labs (Snuggle Truck), the shoot-and-loot 2D platformer from 2011 has transformed into a decently fun auto-running shoot-and-loot 2D platformer. In the game, players again assume the role of P. Walter Tugnuts, who runs from left to right across the screen. He can shoot and jump with taps of the screen, while swiping up or down switches him between the three lanes which make up his path. 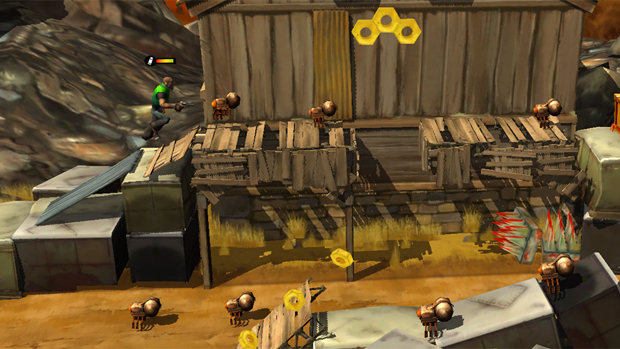 Players earn experience for collecting nuts and killing robots, which unlock new weapons and gear in the in-game shop. I thought it was a fun little thing for the hour or so I've played it this morning. It would be appropriate for any scenario where one has a few minutes where they're not doing anything. It's also free, supported by ads and in-game purchases, so it probably won't hurt you to check out.